Keanu Reeves was in Berlin as the producer and presenter of Side By Side, a well-received documentary about the changes in filmmaking presented by the digital revolution. Reeves spoke to select journalists with Side By Side’s director Chris Kenneally, who he met working on a previous film. The film includes interviews with greats such as James Cameron, Martin Scorses, Chris Nolan, Lars von Trier and the Wachowskis. 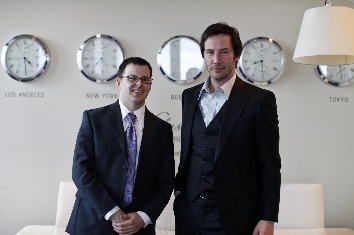 Reeves is currently in pre-production in Beijing for his directorial debut, Man of Tai Chi. He says that “because of the circumstances” he’s going digital on that one and that he’s “happy” with that decision. He’ll use the ARRI Alexa Studio.